Dell's Inspiron Mini 10 is joining the coming wave of netbooks that will use Intel's next-generation Atom n450 processor. It'll give you a longer battery life, but may not have much of an impact beyond that. The n450 clocks in at 1.66GHz, and is about 60% smaller and 20% more efficient than its predecessor. Despite the new chip under the hood, the new Mini 10s will have largely the same standard specs as the current model: 160GB hard drive, 1GB memory, built-in 802.11 b/g Bluetooth support, and a 10.1" display. Dell's also offering several HD-oriented features as add-ons. The refresh includes the same HD display option as the the Mini 10 does now, but you can also upgrade to a built-in HDTV tuner (the current only offers standard def). 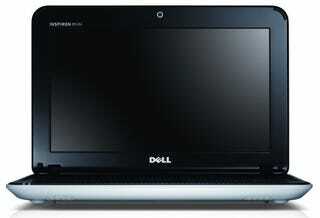 Dell also claims up to 9.5 hours of battery life with a six-cell battery running Windows Starter 7. But the best update may be the price cut: the new Mini 10s will start at $299 in January, fifty bucks cheaper than the current version. available in the Dell Design Studio. information to nearby restaurants, landmarks, maps and entertainment. area; additional charges apply., too. battery life (Inspiron Mini 10 mobility bundle only). with a 3-cell battery Battery Life: Based on preliminary lab testing. Varies by configuration, operating conditions and other factors. Operating system and 250GB Hard Drive. outlets worldwide in the coming weeks. Prices start at $299.